London Arch (formerly London Bridge) is an offshore natural arch formation in the Port Campbell National Park, Australia. The arch is a significant tourist attraction along the Great Ocean Road near Port Campbell in Victoria. 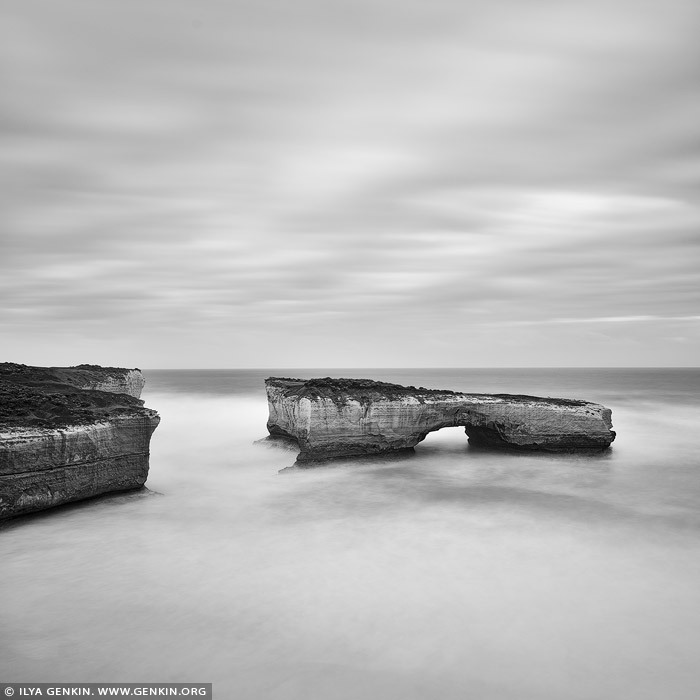 This stack was formed by a gradual process of erosion, and until 1990 formed a complete double-span natural bridge. The span closer to the shoreline collapsed unexpectedly on 15 January 1990, leaving two tourists (Kelli Harrison and David Darrington) stranded on the outer span before being rescued by police helicopter. No one was injured in the event. Prior to the collapse, the arch was known as London Bridge because of its similarity to its namesake. This image belongs to the travel and nature stock photo library. This stock photo of The London Arch in Black and White is available for licensing for commercial and editorial uses including websites, blogs, books, magazines, brochures and advertising. Restrictions may apply for images which contain third party copyrighted material or sensitive subjects. Photos of artwork are for editorial use only. This image id APOST-0033 of The London Arch in Black and White, is copyrighted © by Ilya Genkin. This is not a public domain image.